Not much to report here, this week. I did not buy any fabric. I did finish sewing my stripe blocks for my quilt, but I haven’t finished trimming & pressing. I freehand quilted up four yards of fleece for a customer order. It’s kind of a pretty cocoa color in real life. The final recipient will be my friend’s father. I think he will like it. I also sold a baby quilt. So does that count as stash busting? It moved out of my stash…lol. I had a pretty busy week, otherwise. Monday, I had a sinus headache, pretty much all day. So after work, I was pretty worthless. I did stay on track with the exercise, pretty well, though. I got four workouts done. I wanted to get in a “last chance” workout yesterday, since today is weigh-in day. That didn’t happen, as we got up and went to Amarillo, to pick up DH’s new Skeeter bass boat! So Flat Stanley got to go to Amarillo sooner than he expected, as we will be going on Wednesday, too, for my doctor appt. It will take us a bit to get that written up for the Princess, but that will be coming in a few days. Some of our pics didn’t come out like we hoped, so we may just do more on Wednesday. I also picked up a new rustic buffet cabinet for the dining room. I’ve been playing around with it this morning, and will feature it in a post in the near future. On the weigh-in…it was hard to stay off the scale during the week, but I made myself do just that. Weighing everyday can get frustrating, too much ups & downs. But, knowing that I was going to weigh-in AND post it here, really did help me stay on track. I’m not “dieting” per se, just eating more “reasonbly” and healthily. I don’t do well with “diets” that restrict this food or that food, so I don’t do them. I’ve also watched what I drink. I’ve mostly drank water, milk or tea. I keep hearing Jillian from the Biggest Loser saying “don’t drink your calories!” So, with all that rambling said…..my starting weight for the week was 153. My current weight is 150. I lost three pounds this week, for a total weight loss of four pounds. I wish I had one of those scales that does the body fat percentage, too, but I don’t. My DH told me Friday that he could tell I looked smaller. I don’t expect to lose as much this week, as I’ve really been struggling with the 140’s for over a year now, but I just have to not get discouraged and blow it. Oh, and this included eating bacon, eggs & pancakes for supper Thursday night, and going to our favorite Mexican restaurant Friday, and eating cheese chile rellenos. I’m definitely not going hungry…lol! In knitting news, I have discovered I have project-itis, just like with quilting. I have several items going on different sets of needles, all needing finishing. Mostly scarves, one practice hat, and a special project, a prayer shawl, for someone that needs comforting. I think working on it comforts me, too. I signed up for the knit & crochet online community, Ravelry, and got my invitation to join yesterday. It will take me a while to figure out my way around there, but it looks awesome! Well, that’s I guess that’s it for my Sunday Report. I have a feeling I might not get much done today, either, but that’s ok. I’m tired! I love your Sunday report Randi. I like seeing what you have got done. I realy like the fleece. It’s so pretty. Congratulations on your weight lose. WOOHOO!! That is great. That fleece is beautiful, I love the leaf pattern. I love the fleece. I used that panto recently on a quilt and it’s now one of my favorites! Congratulations on the weight loss. 3 pounds is awesome! you have had a busy week! wow! Love the fleece! Can’t wait to see the Flat Stanley report!! 🙂 And with the weight loss…. I always tell myself to just make healthy choices all around and the weight loss seems to follow that choice 😉 You’re doing good! Good report … especially the weight loss! Yay! Your comment on liquids is so true. I’ve recently changed what I drink after discovering the calorie content of some. Keep up the good work. The fleece looks great!! Your fleece throws have inspired me to purchase to get done for next Christmas. They are under the frame ready when I need something to work on. Great report and great weight loss. If you feel like it, check out my blog on Weds. I started a Mr. Linky thing so we can cheer one another on in weight loss. I love the fleece esp the colour. and way to go on the weight loss, good for you for taking care of yourself and great attitude too about changing lifestyle instead of dieting/restricting foods. 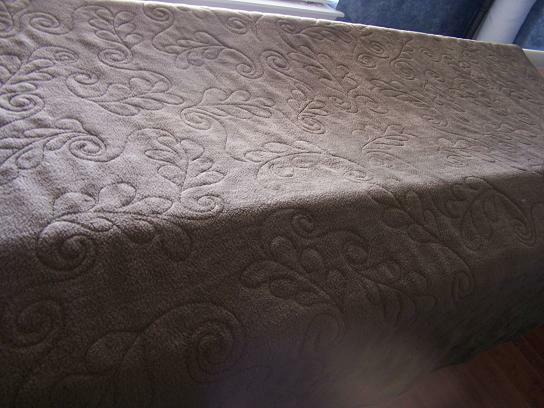 I often use flannel for the backs of quilts and my son just adores fleece backed quilts! Your quilting looks great on that! The fleece look great! You have been a busy girl this week! Congrats on the weight loss…3 pounds is a great weeks loss! Congrats on the weight loss!!!! You did fantastic!! Exercise is the key and also being aware of what we put in our mouths. I love the fleece quilt. Great job Randi on your non-diet. I am getting on the same train but am not so brave to post. My sister recently joined ravelry, look for Jennyd. She swears it’s the best. I was wrong my sister is ‘Jenny knits all day’ on the ravelry. ooops!